When SIL told us she (and her son) successfully balloted for tickets to NDP Preview, we were excited! Finally! We get to watch the parade together and in the SportsHub!!! We had enough tickets to bring in everyone in the family to catch the show, first for our parents, first for our kids. Three generations of us spending our Saturday together to catch the preview of our Nation’s 51st Birthday celebration. The moment we sat down on the seats, I had my first Awe moment. I am inside the National Stadium like finally! Ohhh there’s some cool wind blowing from underneath our seats… this is so cool… look the stadium is huge! Wait! The SportsHub is closed?? So no red lions? No fighter jets? Awww… that’s sad leh. WOAH! 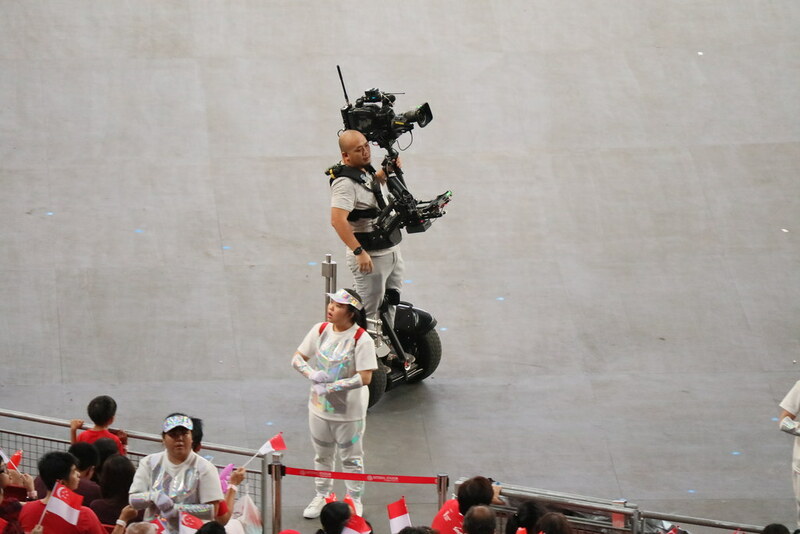 They got their videographers on segway! Cool lah! So we were seated and ready to start the pre-celebration… a little too early. It was 4.40pm, still 2 hours away… we tried occupying the kids with snacks, videos, and eventually they took a nap just in time for the show. Helllllllloooooo Singapore!!! … the 4 hosts came on stage and we were all ready to roll! By now the stadium was completely filled and everyone in red or white! So pretty! However, for NDP this year things are different. The usual fanfare at the start of the show was not as happening as previous years. There was no man falling down from the sky so the audience didn’t get to go “Ooooooooooo”. There was no need for earplugs as there was not thundering sound of the jets. When the national anthem came on, we couldn’t even see the flag fly-by the stadium. 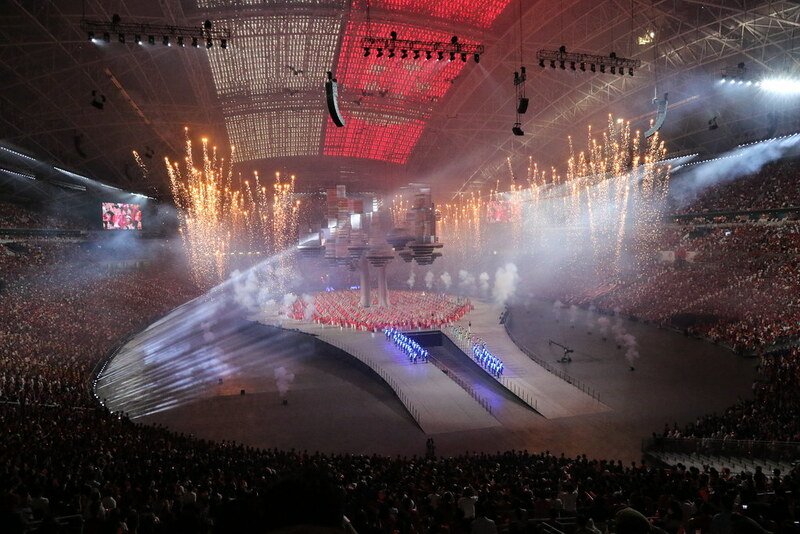 But all the above didn’t stop the 55,000 spectators from enjoying the show and be in awe. 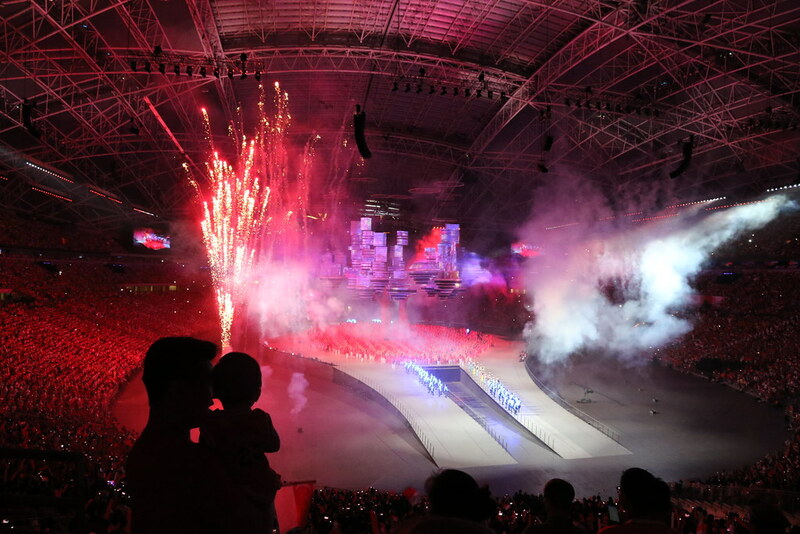 The hosts got us all to bring back the Kallang Wave, back to where it originated. 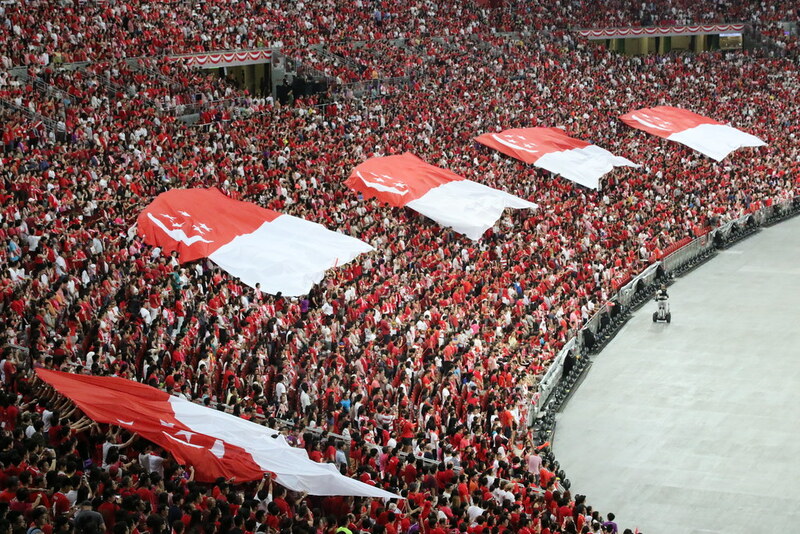 Yes we do this every year at National Day (which some call it the Singapore Wave), but this year, its just different. 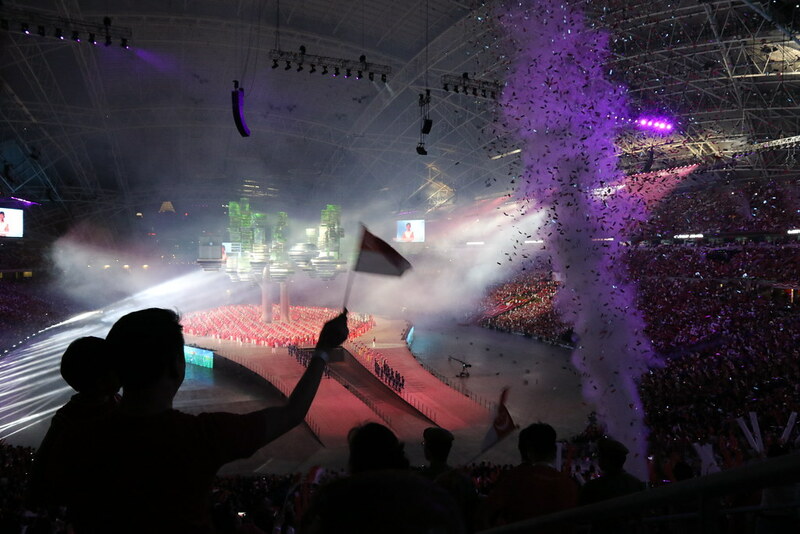 At the preview I was at, everyone was overly enthused about the Kallang Wave… we almost didn’t want to stop! I lost count how many times we stood up and cheered when the wave was at our sector. The sight of the wave going around the stadium was awesome! Another moment of awe. 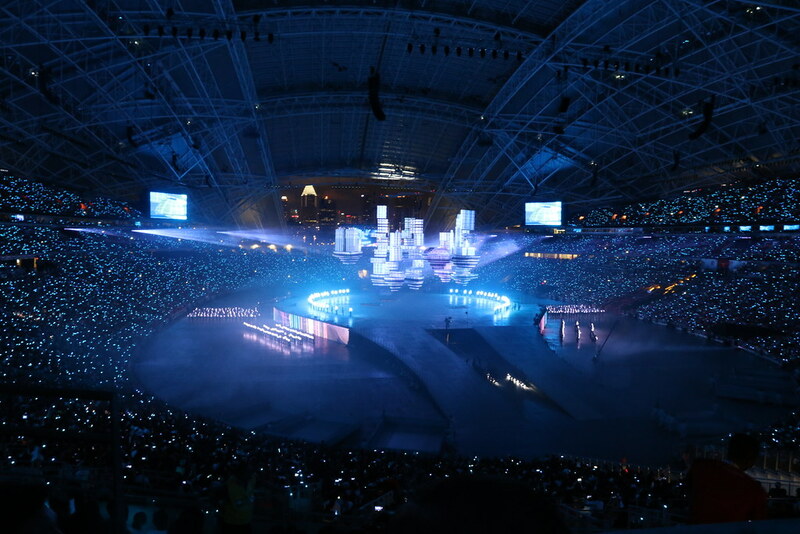 Though there was no air display, no sea action, neither was there wind blowing into your face like sitting at the floating platform, but this celebration is packed with hi-tech stuff which got everyone seated at the stadium to participate in all the performances. We were given a LED wristband which didn’t light up nor blink when we wore it as we entered the stadium… Aiyah! Mine spoil one, cannot light… Mummy why no light??? That were our grumbles when we tested our wristbands. But when the magic happened… we went “Wahhhhh!!! Cool!” The next moment of awe. The LED lights were controlled by the people behind the show! It is wirelessly programmed to blink in tandem with the show’s lights and sounds, and capable of emitting lights of varying intensity in 16 colours and four modes! 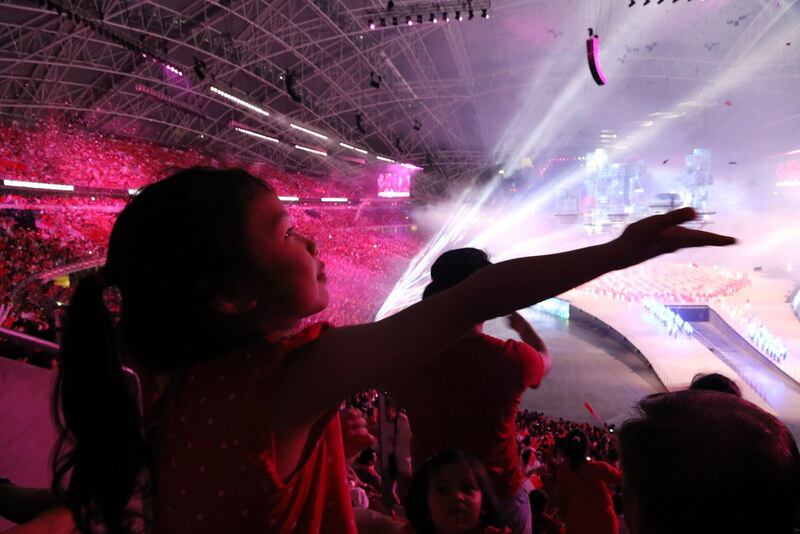 It’s just awesome to see the whole stadium light up together with the performances, our girls were going… “Mummy look! Mummy look!“, asking us to look at the lights on their wrist. After the show, you still can get lights from it by waving the LED light, but the only colour you’ll get is red. 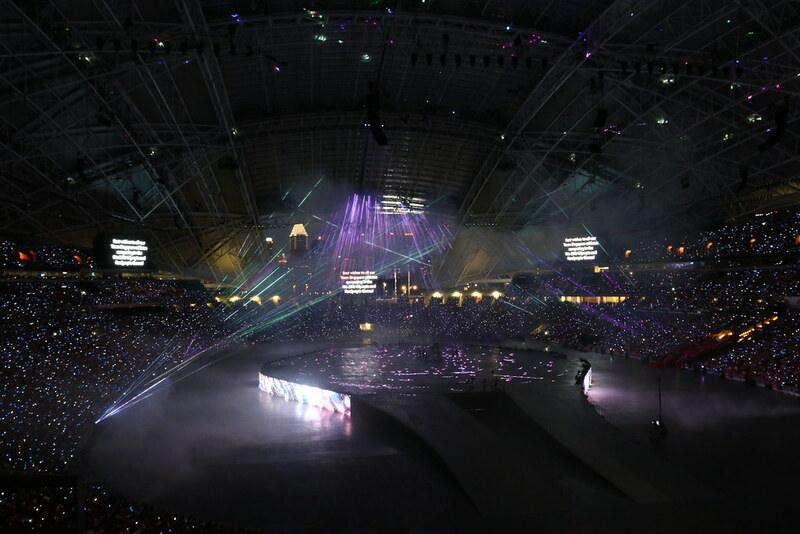 Because of the covered stadium, the show had some awesome hanging display which added wow factor to the show. 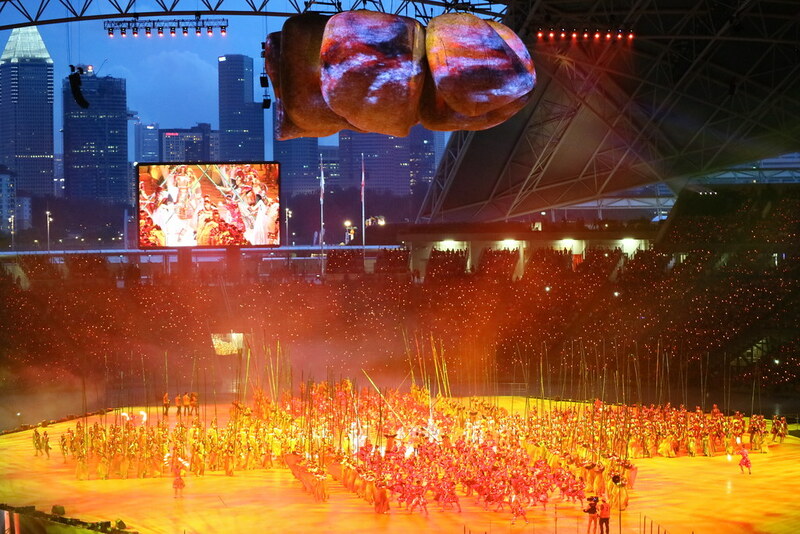 The “Singapore stones” hanging and later brought down to land as the story unfolds. 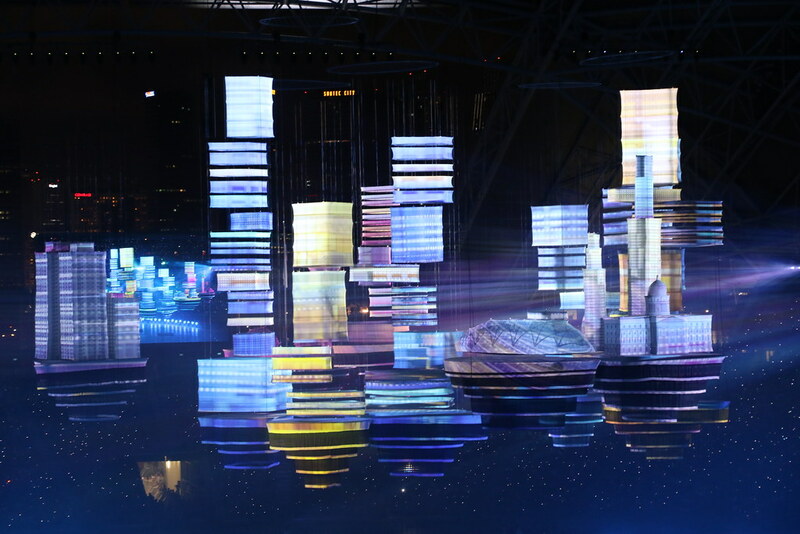 My favorite part of the show was these floating structures of Singapore. A closer look at these beautiful floating pieces. 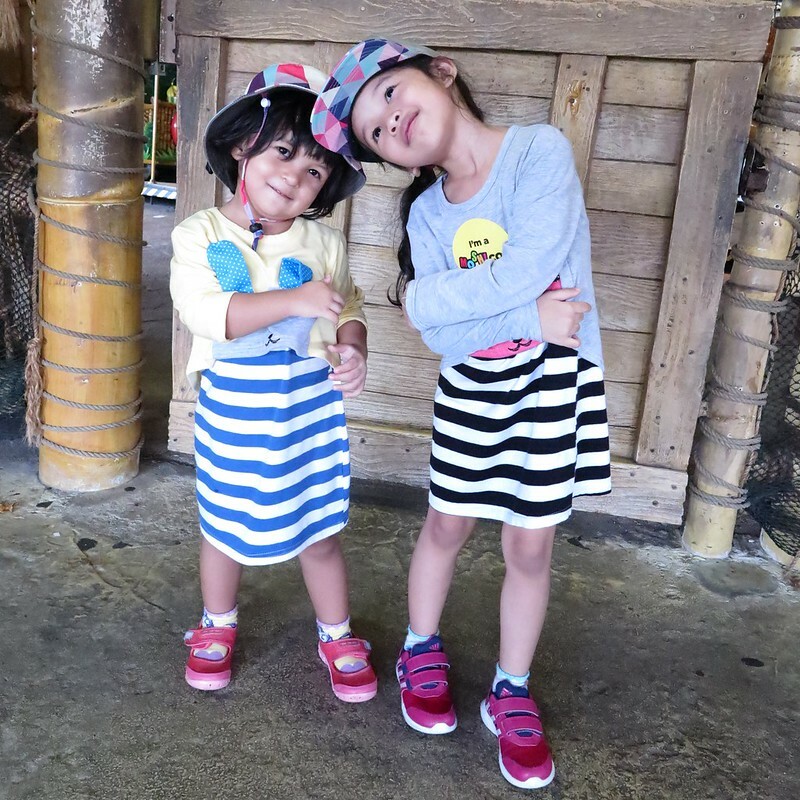 “Mummy see unicorn!” When we keep dreaming… beautiful things can happen. Cool light show here! This is like once-a-year kind of thing for me where I take our pledge and sing Majulah Singapura. I had a huge lump in my throat when standing there together with the 55,000 others. Makes me feel a little more Singaporean lah. My girls didn’t know what we were doing but followed us and placed their fists on their chest too. I was a little emotional at this point. Our flag lighted the stadium for the finale. Everyone in the family enjoyed the show and we are very thankful to have gotten these tickets for the preview show. The father-son moment, that’s Isaac you can read more about him on Punggolbabies.com. My super enthuse brother and his son. We’ll be catching the LIVE telecast of the actual day celebration somewhere on 9 August 2016, possibly somewhere where we can catch the full fireworks since we didn’t get to see any of it when seated inside the stadium. To those going for the preview tomorrow and the actual day show on 9 August, enjoy the show and rest your feet while you’re at the stadium. The real (and not-so-fun) experience is the after-show, where you try to get on the train or other public transport. That night the train stations were packed, walkways and roads around the stadium was filled with people. 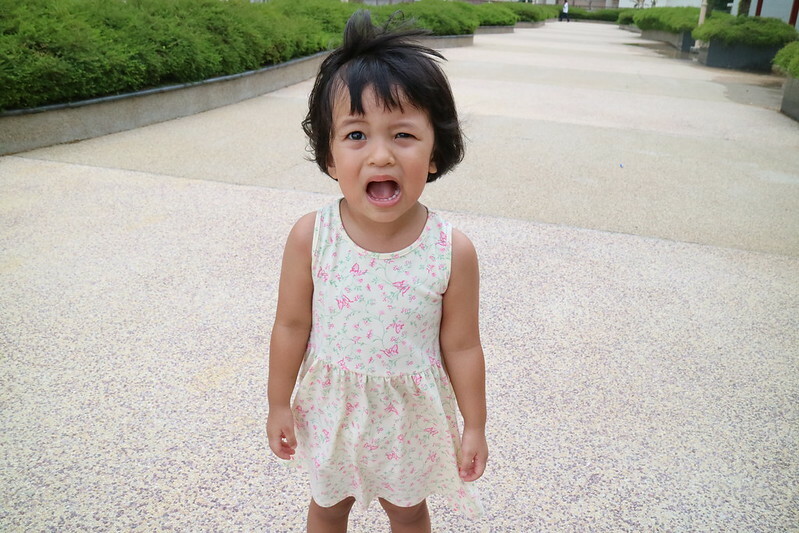 We walked all the way to the hawker centre at Old Airport Road with 3 kids in arms… it was really no joke. 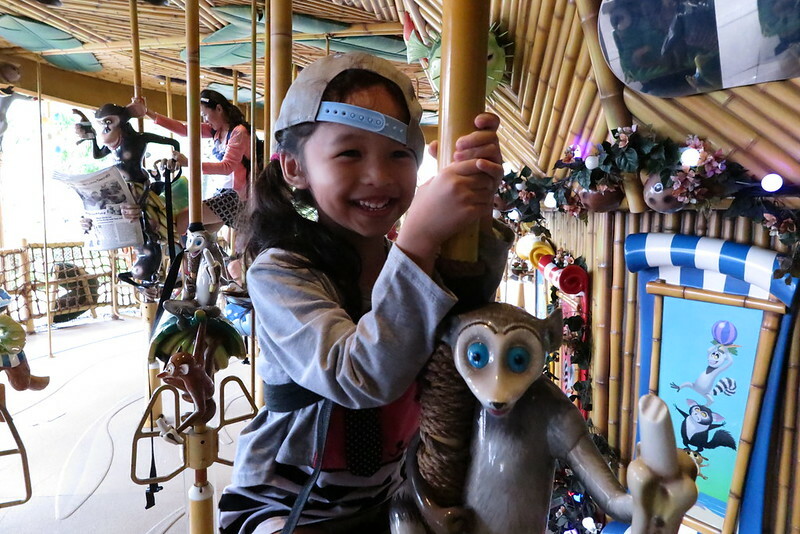 Nevertheless, it was still an awesome experience for the family! Thanks Pris and Isaac for successfully balloting the tickets! Next year we try again ok? That day I had 3 cameras with me – Canon EOS 7D Mark II with EF-S 15-85 USM (for wide angle overall shots), Canon PowerShot M3 with 55-200mm lens (for zooming and “spying” searching for familiar faces in the sea of red) and the Ricoh Theta S 360 camera (for fun shots, see posts on my Instagram). Each had its own purpose and I think I’ve lost touched with using pro DSLR camera as I’m too used to the PowerShot cameras. I’ve been using the Canon EOS 7D Mark II for a few occasions over the past few weeks mostly for video shoot which I’ll share more in another post. This DSLR is in the Canon semi-professional series and is packed with many features and options for professional purposes I still haven’t figured everything out. (I’m a noob!) With 65-point all cross-type AF system and ability to shoot 10 frames per second, you control exactly what you have to shoot and focus; even in fast action situations. Think I’ll need to take more practice and hands-on with this camera in order to master it. I shall stick to my EOS M3 for now.